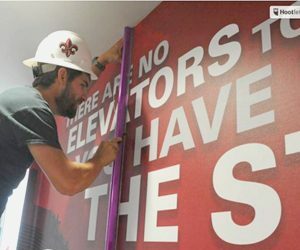 LAFAYETTE, LA – August 2014, the University of Louisiana-Lafayette broke ground on its new $30 million, 100,000 square-foot Student Athlete Performance Center. Pixus Digital Printing met with university officials and architects to review ideas, concepts and plans for the interior’s graphics. Approval came in the summer of 2015 to begin production and installation. 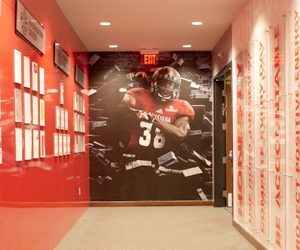 Over 5,000 square-feet of various printed wall coverings were used in the process, laying foundations for graphics, murals, 3-dimensional signs and more. 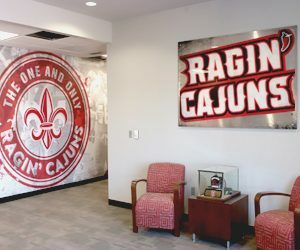 While basking in the grandeur of Louisiana-Lafayette’s Student Athlete Performance Center, university officials remind all to remain focused on the little things. And the small trappings of a growing athletic program have now been swept away in one massive undertaking. “Players sat on the locker room floor when coach Hudspeth wanted to have a meeting.”Athletic Director, Scott Farmer. Speaking to media and former athletes during a recent tour of the new facility. Sitting on the locker room floor is no longer the normal, now that the impressive 150 seat team meeting room is completed. 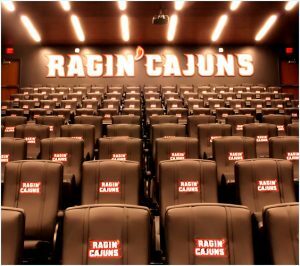 With it’s matte black walls, the expansive 150-seat auditorium features row upon row of slick leather seats emblazoned with colorful Ragin’ Cajuns logos. 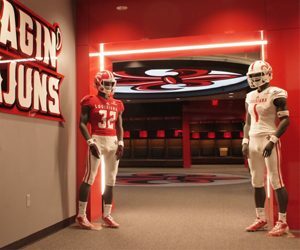 Mounted on the interior wall at the rear of the auditorium are gigantic four foot tall and three dimensional letters that sport the name of Ragin’ Cajuns. The Athletic Performance Center is split into two wings. One wing designed to accommodate each sport of athletes and the other specifically devoted to football. It all began with its core value graphics printed on specialty wallcovering reaching from floor to ceiling printed in white ink. 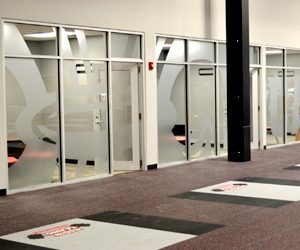 The first wing houses an impressive 12,000-square feet weight room with eight training offices spanning the length of the weight room. Each is designed taking advantage of floor to ceiling windows covered with etched vinyl Fleur de Lis graphics. Decorative, Functional and Private. Included in the weight room are 38 individual work stations with each bearing a 500-pound load. In addition is 60 yards of racks holding 180 pairs of dumbbells. 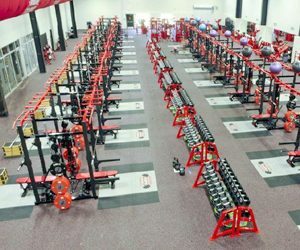 The new Cajun’s weight room is large enough to accommodate each one of the university’s sports teams at once. 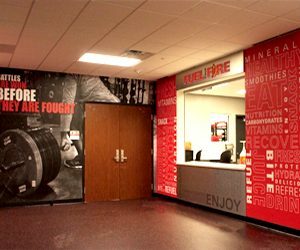 Located near the exit to the weight room is the nutritional window, available to athletes for post-workout meals. The exterior wall graphics of the nutritional area are decorated with colorful printed murals and specialty graphics. 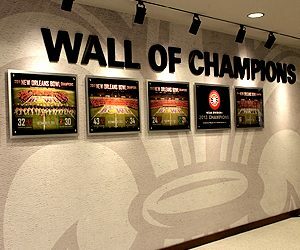 The “Wall of Champions” is located and highlighted in the hallway leading up to the entrance of the football players locker room. A uniquely designed modular system highlights photo frames made of brushed silver panels and acrylic. The wall space is designed for additional growth and weekly photo changes. The Wall of Champion’s letters are constructed using 3/4 inch die-cut cast metal. 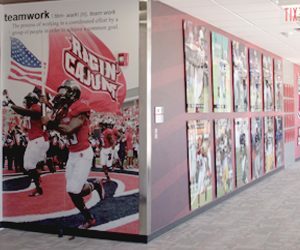 Interior graphics, wall coverings, and signs for the Student Athletic Complex were produced and installed by Pixus Digital Printing.